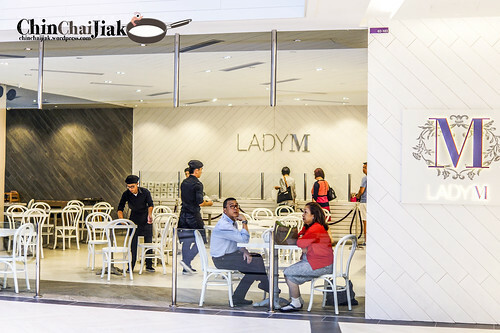 Lady M Confections Singapore markets itself as a popular confectionery situated in New York. 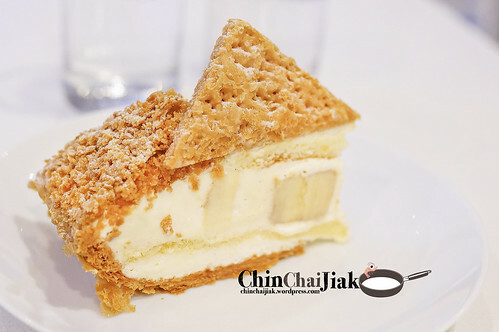 This is only their fifth outlet worldwide and best known for their signature light cream crepe cake. 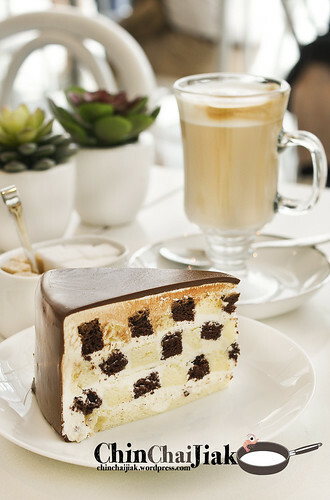 They also offer other dessertss like strawberry shortcake, chocolate and vanilla checkerboard cake, baked cheesecake, Eclair, Mont Blanc, and many more. The checkers. Looks good, and the chocolate layer is good, but it’s actually an ordinary sponge cake in the center. I visited this place on a weekday evening at about 6.15pm and i was rather surprised that there was not much crowd. Probably the crowd will come after dinner? Apart from the signature crepe cake and strawberry short cake, i asked for recommendation from the counter staff and this guy recommended their banana mille feuille. New menu with indicated price. 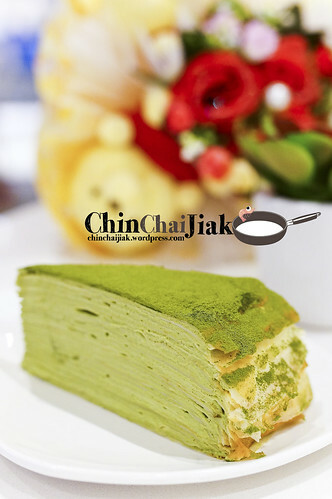 The green tea crepe cake has became part of their regular menu and Lady M is now selling savoury items. I haven’t try it though, but it looks pretty expensive to pay $21.06 net for a ham and cheese sandwich. 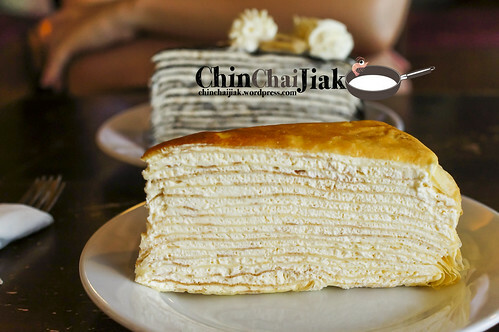 For people who don’t like something too sweet and creamy, their Green Tea Crepe Cake is a better choice than the original crepe cake. Many said that the green tea version is better than the original. For me, i thought the green tea taste is a little too heavy though, but i figure out that those who really like green tea may like this. I still prefer the original crepe cake. 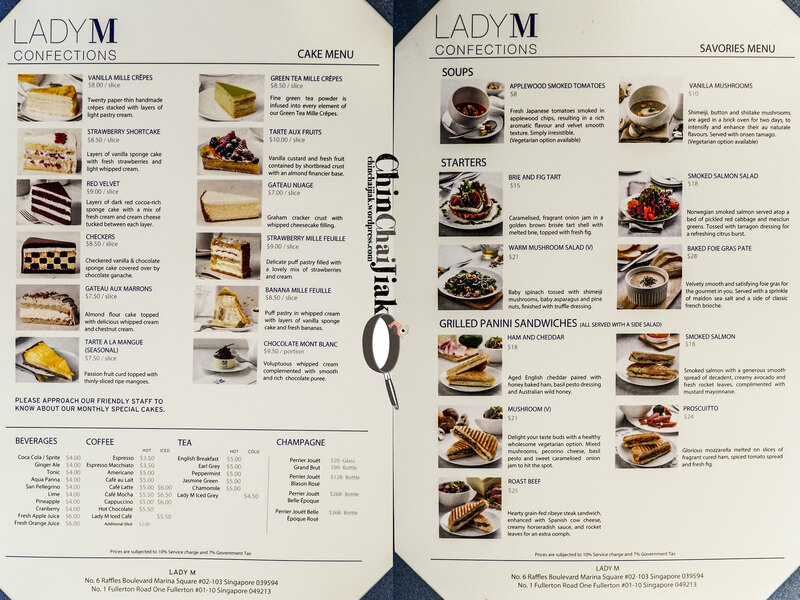 Lady M’s signature crepe cake took around ten hours of preparation before serving in the restaurant which they proudly boast that their crepe is so thin and finely prepared that there are at least twenty layers of crepes and cream in every slice of Lady M’s crepe cake. The cream is really soft and smooth, until some point, if it’s left in the open for a while, the crepe cake will just collapse when I try to cut it with the fork. I recommend them to provide fork and knife for this cake. The fillings had a very light aromatic cream taste followed by a bit of sweet condensed milk after-taste. I thought it would be really ideal if the cream can just be a little less sweet. The paper-thin crepe is really good. Much much better than some that I had tried some where the crepe is so thick that I can feel that I am biting on the flour. 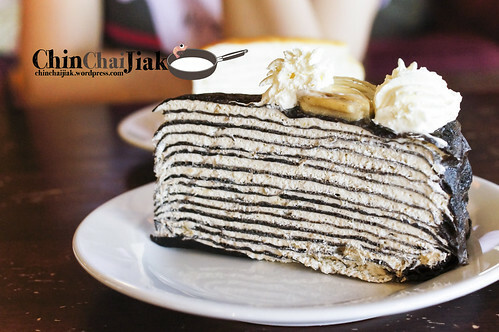 Their crepe cake can be sliced through beautifully by using just a fork and therefore I can taste the well-defined crepe and the layering of their aromatic cream with every bite. But I thought it’s because Nadeje kept their cakes slightly chilled. To be fair, Lady M’s crepe cake fares better than quite some of the crepe cakes that I had. This cake is also one of their specialties. The best part of this cake is for it’s center sponge cake portion and I can say that it’s not too exaggerating to say that it literally melts in my mouth. 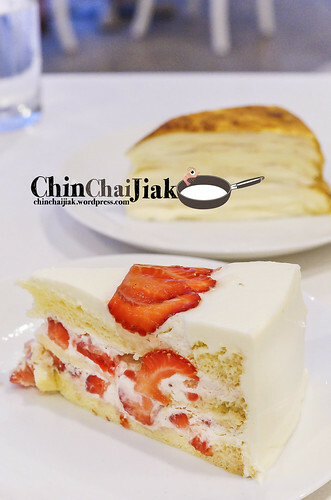 I quite like the overall texture of the cake, with a layer of strawberry puree at the center with thinly sliced sweet sour strawberries mixed into the cream. And for those who are going to try this out, can you tell me did you taste a tinge of hazelnut in it’s cream? I know it’s weird, but i really tasted some kind of nut taste in the cream. 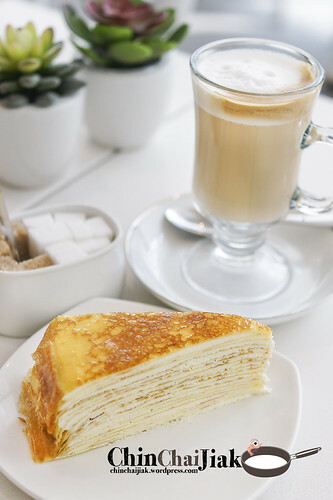 Their mille feuille is unlike the traditional mille feuille, the strudel pastry is crushed and sprinkled generously on a thick layer of cream and sliced banana. I thought the cream would be infused with banana but it didn’t so this cake did not surprise me as much. 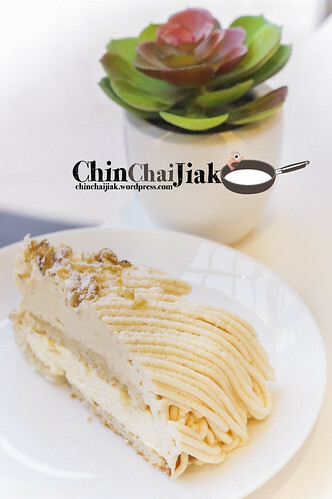 The cream taste really fresh and somewhat similar to the crepe cake’s cream but with a layer of vanilla sponge cake in the middle. This taste quite decent, but if you ask me, i will choose the crepe cake over this anytime. I did a look up for Gâteau aux Marrons (pronounced as Gair Two Ox Meh Ron) and it means “Brown/Chestnut Cake” in French. The top layer is covered with sweet chestnut infused cream topped with crushed walnut, and it’s slightly, only slightly sweet for my preference. Another layer of non-sweetened cream is sandwiched by two layers of almond flour. I like the Almond flour layer very much, easily the best part of the cake. I think the whole idea is to not eat the layers separately, like what i did, as i wanted to taste what exactly are these layers, so that the sweet cream layer will balance with the non-sweetened cream. The taste of this cake is rather refreshing and glad that i tried this. It had been lest than 9 months and i noticed that price for most cakes had increased. The strawberry short cake increased it price from $8.75 net to $9.95 net and that’s a 13.7% increase. It seems not as worth it as before, especially with so many new cafes popping up that offers similar dessert at a much more reasonable price. Apparently, seems like Lady M did not bring on the hype that i was expecting, which is a good thing. I don’t want to queue for 120 minutes just for some Dim Sum. 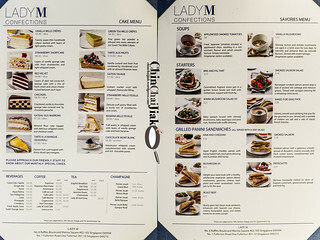 Anyway, I thought Lady M is quite decent, and may come to my mind if i am looking for a decent dessert in Marina/Suntec area. Probably i will also feast on the crepe cake immediately when it’s served. I wonder did i take too long to shoot the cake and that is why the cream melted. Lady M, can you also serve me with a knife next time so that i won’t make a mess out of my crepe cake.